One floor of an old industrial building inside a perimeter block in the heart of Helsinki was turned into a 205 m² private apartment. 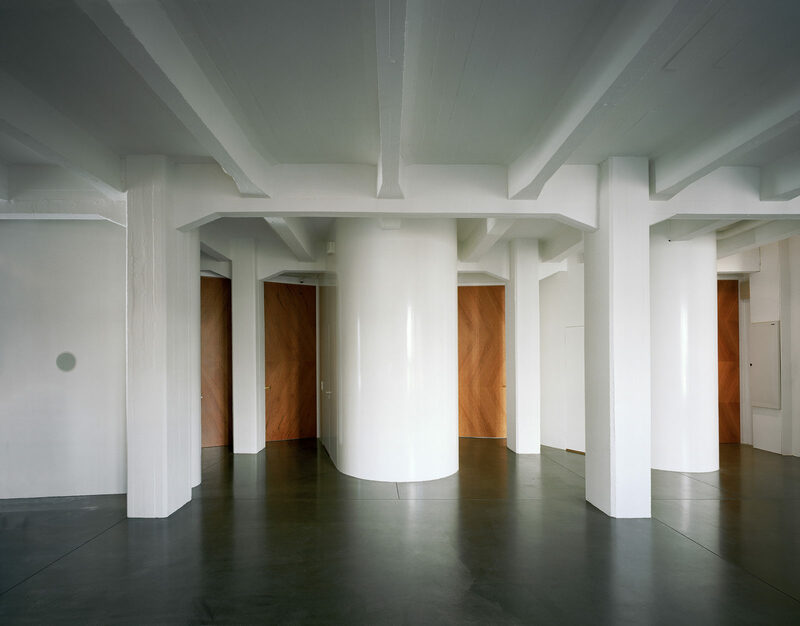 The free height of the space is 3.8 meters and there are exposed concrete beams in the ceiling. The client wanted a unique apartment with light and spatial excitement, and enough room to exhibit the family’s private art collection. Industrial character and charm of the old space and building was to be kept intact while adding living facilities of very high quality. The design makes a clear distinction between old and new elements by leaving the old space as a fully visible frame for the new living functions. The bedrooms are formed by the smoothly curved volumes that contain the most private areas. These new glossy elements intertwine with the existing envelope with its concrete roughness intact. By opening the large doors between the volumes, the apartment becomes one singular large space. The apartment has two terraces and a spa-like sauna department. Two floor-to-ceiling windows were added to bring extra light into the deep space.